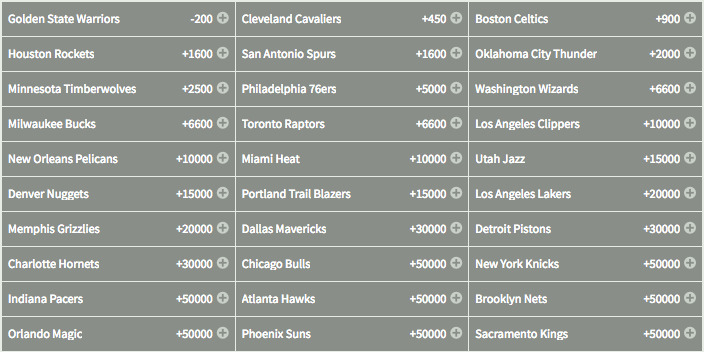 Golden State remain favourites to win an NBA championship for the next few years by retaining Steph Curry and core contributors who nearly pulled off a perfect 2017 playoff run. The Warriors front office built this juggernaut through contracts which don’t reflect the true value of their stars. The FiveThirtyEight projections suggest that Curry’s value outpaces the compensation he’ll receive with his new contract. In 2018, Curry’s projected to provide $73.2 million worth of benefit to the franchise, far more than the approximate average of $40 million he’ll earn over the next five years. Prior to this contract, Steph earned a total of about $34 million over the past three years, representing the best bargain in the NBA. A two-time MVP and NBA championship winner with an average cap hold of less than $12 million allowed Golden State to retain Klay Thompson and Draymond Green, and add a fourth superstar in Kevin Durant. There was a time when Curry’s previous contract was considered a massive risk – nobody knew if his ankles would survive the NBA grind. Steph put in tireless work to prepare his body and refine his already prodigious talents, rewarding the Warriors by becoming the best shooter in NBA history. Similarly, Kevin Durant decided to accept less money to help the Warriors stay in contention. Rather than push for a max contract of around $36 million, he accepted a sharp reduction in pay, signing for $25 million during the 2017-18 season. Considering he’s the MVP of the 2017 NBA playoffs, perhaps the best player in the world, KD was given credit for keeping the current Dubs together. Durant created space for key depth acquisitions under a tight salary cap, extending the Warriors advantage during the offseason. Andre Iguodala, Shaun Livingston, David West, and Zaza Pachulia were resigned, and shooters Nick Young and Omri Casspi were poached from the free agent market. With the core retained, the team now becomes even better on paper than last year: Young and Casspi fill the need for a couple of catch-and-shoot specialists, both on favourable contracts. The selflessness of Kevin Durant, combined with the prior salary sacrifice of Steph Curry, empowered the Warriors front office to build a lasting superteam under a restrictive collective bargaining agreement. There's zero chance that Golden State could afford to pay full value for their historic lineup while retaining full depth within the rotation. KD accepts far less than he’s worth for a shot at becoming the most dominant team in NBA history. Despite the historic strength and depth of the Golden State lineup, the rest of the western conference refuses to quit, chasing an historic upset with aggressive player deals. In fact, James Harden received an even bigger contract shortly after Curry signed. The Houston Rockets also swapped Lou Williams, Patrick Beverley, and a variety of assets to recruit Chris Paul away from the Clippers. Jimmy Butler joined the Minnesota Timberwolves in a surprise trade with the Chicago Bulls, boosting the young lineup into genuine contention. Russell Westbrook will pair with Paul George to create a lethal pairing for the Oklahoma City Thunder. Golden State needed to retain their core and add depth to remain overwhelming favourites, especially with the surprising aggressiveness of western contenders. The sacrifices of Kevin Durant and Steph Curry over the past half-decade maintain the overwhelming advantage that the Warriors enjoy heading into the 2017-18 NBA season. Football? Golf? Soccer? Do you know the fastest Sport played on grass?